Golden ale base, barrel-aged over eight months on sour cherries and cherry juice in ex-Bourbon barrels. A - Light crimson color, active carbonation yields a pink froth. T - Cheery flesh, some bits of ripe pineapple, sweet tart candy, interestingly some solid malt presence. Large pink head which settles in a rocky fashion, but leaves little lace as it recedes. Better lace after each sip (some spots and streaks). The liquid is cloudy and red-orange. More sour than cherry-like to the nose. A lambic with a touch of fruit, perhaps? Little sweetness. The flavor is very sour, even for a lambic. Even the cherry flavors are exceedingly tart. Rich body with a high carbonation level. The swallow and aftertaste is lip-puckering in a positive way. It reminds me of a grapefruit--despite the age, it hasn't seemed to mellow with time. I have a 2017 version and will be curious to see how that one lands. Decanted from a 16.9 oz (500 ml) bottle into a Jack's Abby conical pint glass; production code 01295 -- obtained at brewery in October 2017 and refrigerated since then. A: Pours a rose-peach color, clear at first, but becoming increasingly hazy during the pour. Looks very akin to pulpy, pink grapefruit juice at the end. No more than a quarter inch head the dissipates rapidly, leaving no significant lacing. S: Aromas of cherry sour candy and grapefruit most evident. Slightly acrid. T: Significantly tart (enough to make the mouth pucker) with loud cherry and lactic acid flavors. Sourness a touch overpowering at first. A little funky (in a good way) which only adds to the complexity. Bitterness hardly in evidence. M: Light bodied with no more than moderate carbonation and mild astringency. Very crisp and refreshing. O: A solid, American made take on Lambic. 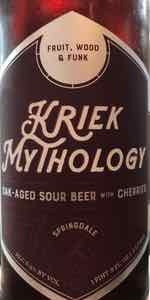 I appreciated that more natural tasting cherry flavor which is a departure from many Kriek style lambics. Enjoyable and would try again if the opportunity presented itself. Pours a hazy amber with a loose head that dissipates into a thin tight band around the edges. Nose expresses the faintest hints of medicinal cherries. Taste reveals tart cherries, a hint of cinnamon and some medicinal notes. Mouthfeel is light in body with a carbonation just shy of lively and a mild astringency. Overall, I'm not a huge fan of the style in general but I found this beer quite enjoyable. Well worth your time if the opportunity presents.